Father's Day is coming up and if you're unsure about what to get your father/husband/loved on here are some fabulous ideas. These gifts are especially great if you have a traveling father who is always on the go. 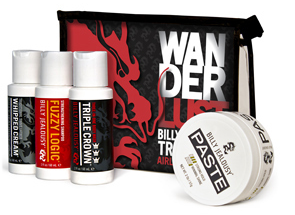 Wanderlust Travel Kit For the dads that are always travelling for business or just travelling the world, Billy Jealousy presents the Wanderlust Travel Kit! This kit includes the Whipped Cream Traditional Shave Lather, Fuzzy Logic Hair Strengthening Shampoo, Triple Crown 3-in-1 Body Wash, and Sculpt Friction Fiber Paste, all in airline approved sizes. So while he’s on the road, tell him to leave that hotel stuff they supply him with in the dust, everything he needs is right here. 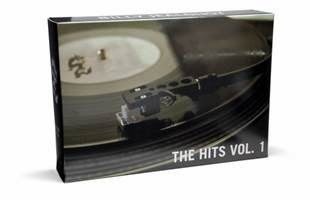 Old-School Dads The Hits, Volume 1 For those old-school dads that are still listening to their vinyls, Billy Jealousy presents their greatest hits, volume 1! This gift set includes the Fuzzy Logic Hair Strengthening Shampoo, Hydroplane Super-Slick Shave Cream, and Ocean Front Body Wash.
Outdoorsy Dads Beard Envy Kit No longer does loving the outdoors equate to looking like a caveman! 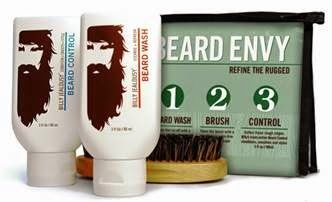 Billy Jealousy’s Beard Envy Kit is perfect for those dads that love to fish, hike, and camp but want to look ruggedly refined while doing it. It includes a hydrating beard wash, a dual-sided, firm boar bristle brush, and a beard styling product to tame your dad’s beast of a beard! 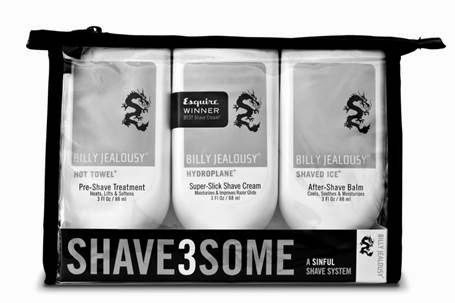 Wall Street Dad Shave3Some If your dad is a mogul-in-the-making and needs help looking the part, Billy Jealousy’s Shave3Some has got him covered for when he’s on the ground or in the air jetting off to a meeting! The Shave3Some includes the Hot Towel Pre-Shave Treatment, Hydroplane Super-Slick Shave Cream, and Shaved Ice After-Shave Balm for a close shave that will leave him ready to tackle the board room! All products are available at Billy Jealousy's website. This is really helpful with father's day coming up. Thanks for the suggestion~!